While you may know a great deal about nurturing others, advancing or even recognizing - your own needs may not be second nature. Women spend a larger percentage of their waking hours nurturing others than men do. Whether women work outside the home or not, studies suggest they average more time tending house and loved ones. If you’re a woman, odds are that you provide the emotional glue that holds relationships and families together. You remember the birthday cards, pick up the phone to offer help or support when someone’s sick, and do much of the work or coordination of services involved in caring for those in need of assistance, the elderly and the children. Our society expects women to be self- sacrificing. Your own needs may take a back seat and putting yourself first is seen as “selfishness”. For men, society places great emphasis on getting ahead. As the saying goes, when the game ends, he who has the most toys wins. This attitude can encourage a single-minded focus on career to the detriment of other activities, including family. 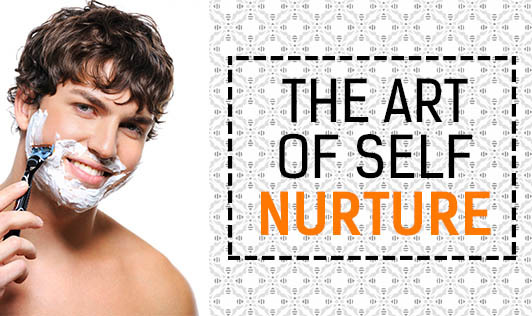 Men are discouraged from indulging their nurturing side. Just as women are pressed to give to others, men are pushed toward the receiving end. That creates imbalances and potential sources of distress for both sexes. If you’re a woman, you may not feel comfortable taking time to rejuvenate yourself. If you’re a man, you may not have much practice creating your own nurturing habits and, like your female counterpart you may feel uneasy doing so. Clearly, women and men can benefit from learning to focus on themselves in rejuvenating ways. The art of self-nurture is not a simple technique. The spark you gain from nurturing your imagination, career, relationships, or spiritual side boosts the healing effects of other stress-relief techniques. Having not spent too much time nurturing yourself over the years, you may not even know where to begin. Men: Take yourself to a proper barber once a month; get a haircut and a professional shave. Have a massage whenever you can – it’s great for stress relief. Take a few hours off work to spend time with your kids –surprise them. They’ll love it and you’ll feel great. Turn the mobile phone off for a few hours on the weekends. It reduces stress and lets the family know you’re really paying attention to them. Learn to cook- it is extremely relaxing and a new skill always makes you feel good. Women: Make time for a beauty treatment or a massage at least once a month. Get someone to take care of the kids and make a “date” with yourself, where you take yourself to lunch, buy a new outfit, or just sit in the garden and relax. Make bath time “me” time – use fragrant oils, candles – and turn all noises off for an hour. Give yourself the bigger piece of the orange or apple for a change. Self-nurturing may take a little while to get used to, especially if your focus has always been on others. But it is vital that you take care of yourself, or you may not even be there when the others need you.